Let’s face it, camping isn’t for everyone. From sleeping in a tent, to the bathroom situation, for some, it’s no holiday. And even for people who absolutely love it, it can be a lot of work. That’s where Glamping comes in. Not sure what ‘glamping’ is? It’s basically ‘glamorous camping’. While the experience can vary depending on where you are, you should expect a hotel experience (real beds, linens, and often, bathrooms) in a camping environment. And you won’t be sleeping in a regular tent – everything here is elevated. I love camping, should I try glamping? Even if you love camping, you might be tempted to experience amazing landscapes with a little more luxury. With glamping, there is no hauling camping equipment, so it’s a fantastic way to see the great outdoors when you’re travelling and don’t own tents, sleeping bags, camping stoves and more. And with glamping sites popping up all over the world, there’s never been a better time to get your ‘glamp’ on. 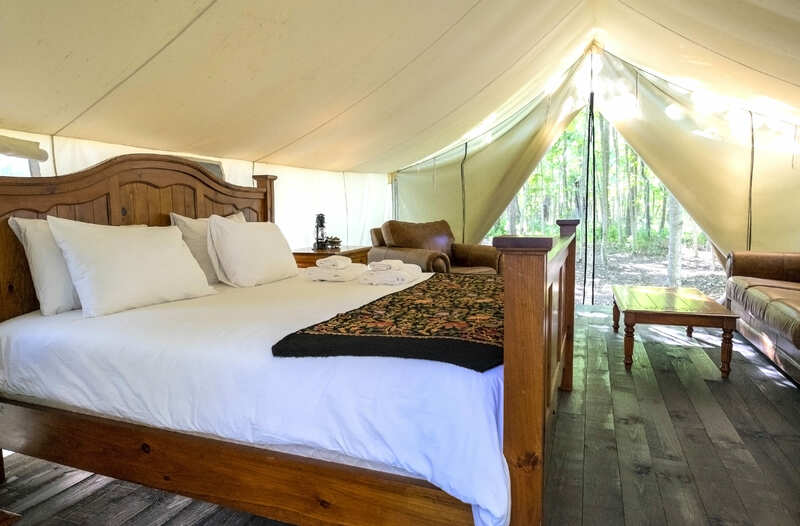 As glamping becomes increasingly popular, new options open regularly – even in provincial parks. And the choices run from elevated or raised camping experiences all the way up to extraordinary luxury). Here are some sites to check out in Canada, and beyond. Les Toits du Monde. Located in the Laurentians, this glamping site is like a ‘choose your own adventure’. With accommodations that range from tree houses to a tipi and even a hobbit house, you might be tempted to give them all a try. Imago Village. Not far from Saguenay, QC, enjoy the view of the Valin Mountains from the comfort of a colourful yurt. Each yurt can fit up to four people and comes complete with a simple washroom and kitchen set-up. Fonterra. In Ontario’s Prince Edward County, enjoy a chic camping set up. Get a good night’s sleep in a large canvas tent with a king-sized bed, and private washroom facilities that include an outdoor shower. This camp is situated on a farm that also has a brewery so good food and drinks are always close by. Ridgeback Lodge. Really want to sleep under the stars? New Brunswick’s Ridgeback Lodge Stargazer Domes might be for you. These deluxe dome-shaped tents have a transparent roof so you can count stars from the comfort of a queen-sized bed. Sandy Pines Campground. Cross the border into Maine to discover these chic, designer tents with full outdoor living spaces. While you don’t get a private washroom, the tents, each with a unique interior design, more than make up for it. If you’re big into micro-houses, try this national park in Manitoba. Instead of tent facilities, you can rent one of these micro-cabins in the park. You still need to bring some supplies, like cooking equipment, and bedding, but it’s a great way to enjoy a true camping experience. Glamping is not just becoming more popular in North America, but also abroad. Home sharing and short-term rental sites, like AirBnB, or https://glampinghub.com/ are great resources for finding unique accommodations in extraordinary settings. It’s all about the lighting. Pack those fairy lights, tea lights and lanterns to set a cozy and atmospheric mood in any tent. Blankets, pillows and more. Forget the sleeping bag and instead pack your favourite linens, cushions, cozy duvets and extra throws. Add a little faux shearling rug to enhance the coziness and sense of luxury. Feast. Forget the hot dogs and feast on gourmet favourites like filet mignon, lobster and other delicious finds. You can even try a locavore experience by hitting up farmers’ markets, or farm stands, near your camping site. Blue Cross travel insurance is a great idea even if you’re not jetting off to the other side of the world. Learn more about the different plans Blue Cross offers from single trip coverage, to plans that cover the whole summer or even the whole year!